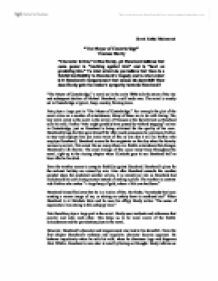 To what extent do you believe that there is a fateful inevitability to Henchard&amp;#146;s tragedy and to what extent is it Henchard&amp;#146;s temperament that causes his downfall? How does Hardy gain the reader&amp;#146;s sympathy towards Henchard? 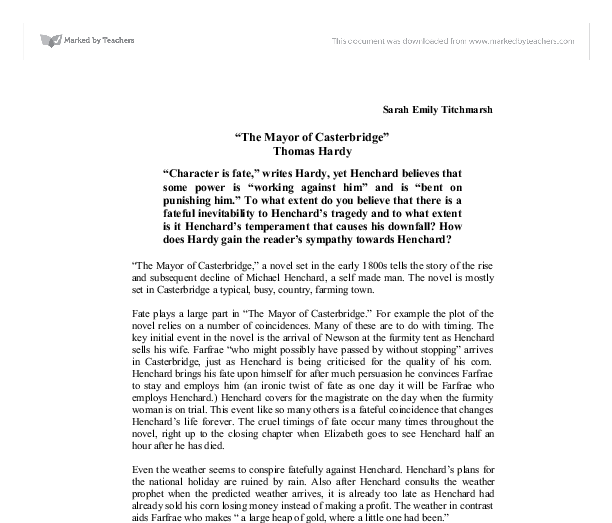 Sarah Emily Titchmarsh "The Mayor of Casterbridge" Thomas Hardy "Character is fate," writes Hardy, yet Henchard believes that some power is "working against him" and is "bent on punishing him." To what extent do you believe that there is a fateful inevitability to Henchard's tragedy and to what extent is it Henchard's temperament that causes his downfall? How does Hardy gain the reader's sympathy towards Henchard? "The Mayor of Casterbridge," a novel set in the early 1800s tells the story of the rise and subsequent decline of Michael Henchard, a self made man. The novel is mostly set in Casterbridge a typical, busy, country, farming town. Fate plays a large part in "The Mayor of Casterbridge." For example the plot of the novel relies on a number of coincidences. Many of these are to do with timing. The key initial event in the novel is the arrival of Newson at the furmity tent as Henchard sells his wife. Farfrae "who might possibly have passed by without stopping" arrives in Casterbridge, just as Henchard is being criticised for the quality of his corn. Henchard brings his fate upon himself for after much persuasion he convinces Farfrae to stay and employs him (an ironic twist of fate as one day it will be Farfrae who employs Henchard.) ...read more. When he loses his temper because Farfrae's business is succeeding, whereas Henchard's is declining, Henchard then says, we'll "grind him into the ground - starve him out ... snuff him out". Henchard is also a very proud man. It is because of this that he refuses to take a room in Farfrae's house or to claim back his furniture. In many ways he is almost too proud and stubborn. This makes his own downfall seem much worse to him. Henchard is extremely jealous of Farfrae. Farfrae seems to make Henchard feel subordinate. Perhaps because Henchard is a self made man, he suffers from a lack of security and feelings of inferiority that Farfrae makes emerge. Farfrae undermines Henchard's authority by overruling him in their treatment of Abel Whittle. This is a major turning point in the novel and from here on Henchard's life begins its demise. When he is losing Henchard gives up easily, with a dumb-helplessness, "misery taught him nothing more than a defiant endurance." When things are going wrong for Henchard he does not act, he accepts the situation resignedly, "I am to suffer I perceive." He is also quite melodramatic which cause him to descend into deep periods of depression causing him in one case to become suicidal. ...read more. After a long search Farfrae and Elizabeth Jane trace Henchard too late to his deathbed. The starkest words in Henchard's will is "that no man remember me." It would be a hardhearted reader who would forget such an unfortunate man. Hardy himself worried that he would not be understood. His main character in this novel is a flawed man. Hardy wrote "The Mayor of Casterbridge" at a time when he himself was feeling insecure. Hardy lost his faith in religion and came to see human beings as victims of fate and chance. He felt lonely, gloomy and misunderstood as his diary testifies. Hardy's life is perhaps in some ways mirrored in that of Michael Henchard's. It's a fine distinction between fate and character and they are very often subtly intertwined. Fate and character coexist in the novel. They are dependent on each other. I believe that it is a combination of character and destiny that cause Henchard's downfall. After twenty-one years Henchard walks back along the same path he travelled many years before. Still alone and with nothing to show for all his pain and suffering. He dies a lonely isolated man, a warning to us all, of character flaws and turbulent fate. ...read more. During her darkest hours, Tess finds no help from the church: the itinerant sign-painter offers merely a creed of abstinence. In red accusatory letters she reads "THY, DAMNATION, SLUMBERETH, NOT" and is horrified to think how relevant it is to her recent misfortunes. presence of Emma's ghost in the landscape governs much of the sequence, and typically Hardy does not discover the presence signaled by 'voice', but rather, at best, a vision of his dead wife as she once was which he can sustain only momentarily. "...his wife, who seemed accustomed to such remarks, acted as if she did not hear them..." The scene is set for a foreboding novel when Hardy expresses his feelings about nature and mankind in the first part of the novel. She isn't mentioned much, until the auction scene, when she tells Michael how his behaviours is inappropriate and irresponsible and is just making a fool of himself. Later on in page eight, Susan gets more serious, realising the great significance of Michael's actions; 'Come, come, it is getting dark, and this nonsense won't do. This is an extremely important observation, because Henchard basically gives up the rights to his supposedly feminine emotions, such as passion and tenderness. Emotions like these are essential to sexual motivation and lust, and without them, Henchard becomes a non-sexual entity, almost verging in being anti-sexual. Hence Henchard is only found in the King's Arm and the Three Mariners', not in Peter's Finger, when the other towns folks are found vice versa In King's Arms, 'the chief hotel in Casterbridge', the events are focussed on Henchard. the identity of the love letters, which were from Lucetta, to Farfrae; ?Such a wrecking of hearts appalled even [Henchard]?, and concludes that ?to accomplish the deed by oral poison was beyond the nerve of his enmity.? This shows that he restrained from animosity and showed his moral conscience, and that his actions abstained from cruelty.